LA MIRADA, Calif., Jan. 23, 2019 /Christian Newswire/ -- Christian broadcaster FEBC (Far East Broadcasting Company, www.febc.org) has launched a year-long initiative to distribute a record number of its free "missionary radios" to unreached people groups, most of whom have never heard the name of Jesus. 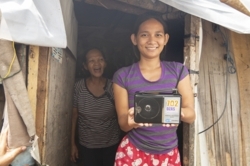 Photo: FEBC's free radio giveaway provides sets that enable people who would otherwise have no access to Christian broadcasting to hear the gospel, like this recipient in the Philippines. Communities in Cambodia, Indonesia and Thailand will be among the first to receive the sets this year, during visits to individual churches and homes by FEBC staff and local pastors, or at special "radio rallies." "We are hearing from our teams in Asia that there is great hunger for our programming, but too often people do not have the money for, or access to, equipment to be able to listen," said FEBC USA President and CEO Ed Cannon. "It's frustrating—like having life-giving water people so desperately need, but no cups to pour it into." FEBC's effort underscores the critical, ongoing importance of traditional radio, even with advances in technology. Almost two-thirds of the world's population has no internet access because of geographical or political restrictions. Meanwhile, some four billion people live within broadcast range of FEBC's 149 stations around the world. "That's half the world's population who can hear about the hope of Jesus—when they have a radio," said Cannon. "And not only can radio reach those living where there is no Christian witness, it also bridges the illiteracy gap that exists in many parts of the world, which makes the use of evangelistic literature ineffective." Cannon had an opportunity to experience firsthand the impact of FEBC's radios when he helped distribute 60 units to ethnic villagers in northern Cambodia, during a recent visit. Among those whose lives have been transformed by one of the radios is a man from the country's Kampong Thom province who told of listening to the ministry's daily "Family Radio" programming in the Khmer language. "It is very encouraging and increases my knowledge as well," he said of his morning listening. "Before we meet people or start working, we have to meet and talk with God first. I want to tell everyone, Christians or non-Christians that if you want to relax, please listen to Family Radio. From my experience, when I feel bad, if I turn on the radio to listen to Family Radio, then I will feel better." Each radio or Gospel Speaker Box costs $40. To support FEBC's 2019 radio giveaway campaign, go to www.febc.org/give-a-radio.